I’m a Christian pacifist. In light of Christ’s death and resurrection, I do not believe that Christians should execute criminals, wage wars or even posses weapons for the purpose of self-defense. While I hold these views loosely- meaning I try to be humble in my assertions and in my own ability to ‘walk the talk’- I also hold them with great conviction. That said, today I am celebrating a holiday of remembrance for all those men and women who have sacrificed their lives in service to the American nation. Today, I am celebrating Memorial Day. There are a couple things about me that make my adherence to pacifism somewhat unique-the first being how many people I truly love and respect who have served in the military. My grandfather was a pilot in World War II. He flew 35 combat missions over Germany, carrying a Bible in his pocket on each flight. Likewise my father- probably the person I admire the most in life- was an Air Force fighter pilot. And I have many close friends who’ve been deployed to Afghanistan, Iraq and some theaters the average American isn’t even aware we’re in. Secondly- and this is the real kicker- I myself am a member of the military. I currently serve as an officer in the Army Reserves Medical Corps. I joined the military because I wanted to be an Army Ranger. But a change of heart toward pacifist convictions led me to serve my commitment in a non-combative role. All of this goes to say that Memorial Day raises some interesting questions for me: should I celebrate those who not only gave their lives but also took the lives of others in service to this country? Can I- in good conscience- partake in the celebration of military veterans and members? Is such honoring also honoring to Christ? The answer to these questions came from an unexpected source: a fairy tale. The Last Battle is the final book in CS Lewis’ famed Chronicles of Narnia series. It’s about the final feud between forces of good and evil and presents one of Lewis’ more vivid depictions of heaven. It’s near the end of the book that the good servants of Aslan arrive in paradise where they encounter an unexpected character. His name is Emeth and he was a warrior and a foe in the previous life, a loyal servant of the god Tash, a god erected in opposition by enemies of Aslan. 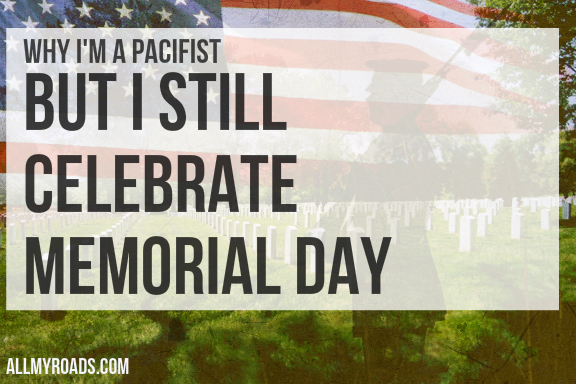 I am a pacifist. But I do not believe soldiers who fight and die for America are evil. I believe that- on the whole- they are sincere, brave, dedicated and remarkably loyal individuals. I can only aspire to be so true. I don’t believe that service to Christ can entail violence under the banner of the American flag, killing for the sake of a nation-state. All that said: the loyalty of soldiers to this country, misplaced though I may believe it to be, is still much greater than any cost I’ve had to pay for my allegiance to Christ. There will always be discrepancies in the ways we show our dedication to Christ. No one lives a life in perfect service to Jesus and I am certainly not the exception. Shall I then judge those whose service to their country they sincerely believed to also be service to Christ? Because ultimately it is not historians, politicians or even the clergy and religious leaders who decide which side of the spectrum a person falls; Nazi soldiers were not all evil and American soldiers are not all pure in heart. It is not the stories as we tell that decide the value of one’s service; such deeds are God’s to judge. And no one else’s. Today, I remember and honor those who gave everything they had: their futures, hopes, homes with picket fences, the sound of their children’s laughter on Christmas morning, the touch of their spouse’s hand upon their skin; today, I remember the men and women who gave their lives in service to this country. I may not believe in the country they served but I do believe in a God who’s grace covers all our best and worst intentions. And I believe that- through the blood of the lamb- God turns all dedicated service into beautiful and willing sacrifice unto Christ himself. And such a God is one worth celebrating. Can Christians Celebrate Memorial Day? Thank you for this. It is beautiful and true… in my humble opinion. My husband is a Vietnam combat veteran. He is also a chaplain. We are both Christians. My husband and I have different ideas about war and weapons. But he is my hero.